When Hazrat Khalifatul Masih II (ra) mentions incidents from the life of the Promised Messiah (as) he does so with the intention of drawing those conclusions or lessons from them that are visible only to a very fine eye to detail and that bestow upon a believer cognizance of the faith and of the true God by pointing out to him the correct paths that increase his faith. Who are you that you should intercede without my permission? Look how great a man the Promised Messiah (as) was – the world waited for his arrival for thirteen hundred years but even he, when he intercedes, is told, who are you that you should intercede without permission. The Promised Messiah (as) says that when this revelation came to me I fell down and my body was trembling as if my life was about to end…but when this condition overcame me, Allah, the Exalted, said, ‘ok, We give permission for intercession. Go ahead and intercede.” So the Promised Messiah (as) intercede on behalf of the boy and Abdur Rahim Khan was saved and was restored to health. This was the Grace of God Almighty and the prayers were accepted and permission was given for intercession. But when Allah, the Exalted, says to a person like the Promised Messiah that who are you to intercede, then what can be said about the station of those others who go around pretending to be big that they should be able to intercede on behalf of anyone. It is evident from ahadith that the Holy Prophet (sa) would only intercede when he was given permission. So how foolish is the one who says that someone would be able to intercede on his behalf. This false notion has led to many bad customs in our societies such as worship of the graves of people and has led to association of partners with God because the people have begun to worship their religious divines. Every Ahmadi needs to remember this well that Allah, the Exalted, has said to the Holy Prophet (sa) also that you will be able to intercede on behalf of someone only when permission is given. 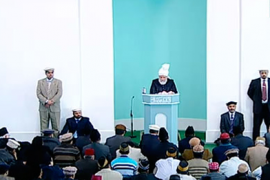 Then giving an example of how Allah, the Exalted, used to manifest His power in the life of the Promised Messiah Hazrat Musleh Maud (ra) says that once he was troubled by a persistent cough. He would stay awake the whole night during the treatment of his youngest son, Mubarak Ahmad. Hazrat Musleh Maud (ra) says that in those days I would sleep at around midnight and would wake up early but when I would go to sleep I would find the Promised Messiah (as) awake and the same would be the case when I would wake. Because of all this effort he began to suffer from the cough and he began to remain unwell. Hazrat Musleh Maud (ra) says that I was given the job of giving the Promised Messiah (as) medicines to drink etc. and it is natural that when someone is given some task he begins to take it as his right to interfere in things related thereto. So being tasked with this work of giving medicines I thought it was my right to make suggestions in the food and drink of the Promised Messiah (as). So I would also submit things by way of suggestions that eat this and not that etc. The remedies that Hazrat Khalifatul Masih I (ra) would send also used to be prepared and made use of along with English medicines but the cough was getting worse and worse. This is an incident that took place in 1907 and Abdul Hakeem, the apostate, had written, after learning of the Promised Messiah’s cough that he would die after being afflicted with tuberculosis. So we were also apprehensive that he should not, even wrongly, be given an opportunity to rejoice. But the Promised Messiah (as) was suffering greatly from the cough and sometimes the attack would last so long that we felt his breathing would stop. It was on such an occasion that a friend came from the outside and brought the gift of some fruits. Hazrat Musleh Maud (ra) says that I presented those to the Promised Messiah (as). He looked at them and said that jazakallah ahsanaljaza should be said to the friend who sent the fruit and then selected, what I think was a banana from among the fruits. Then, either because I used to give the medicines or because the object was to teach me a lesson, the Promised Messiah (as) asked me whether it was considered good or bad to eat it for a person suffering from a cough. I replied that it is not considered good at the least. But the Promised Messiah (as) smiled and began to peel and eat it. I again submitted that the cough is very severe and this thing is not good to be eaten when suffering from the cough. The Promised Messiah (as) again smiled and kept on eating. In my foolishness, I again insisted that it should not be eaten and upon this the Promised Messiah (as) again smiled and said I have just received the revelation that the cough has been cured. So the cough began to disappear from that moment on despite the fact that at that time no medicine was used nor was any precaution employed – indeed precautions were disregarded and yet the cough disappeared ..although for one whole month prior thereto treatment had been attempted and the cough had not been cured. So this is Divine purpose in action but we know that many ills result from lack of precautions and many things are cured through treatment but when Allah, the Exalted, desires He intervenes also and the weapon of prayers has been taught to man for this very purpose so he may go the presence of God Almighty and say that I do not desire liberty, I have become totally frustrated at my condition and circumstances, please bestow your Grace upon me and intervene in my affairs. And Allah, the Exalted, also observes that this person has become reliant on God and desires that I should intervene in his affairs – so He intervenes and manifests His Power. After mentioning this Hazrat Musleh Maud (ra) gave an example that is faith inspiring which relates to Lekh Ram and which can be presented to demonstrate that when God so wishes even though all things are in place for one to be in a good state of health yet illnesses arise..In relation to Lekh Ram God Almighty had revealed to the Promised Messiah (as) that he would die on the second day of Eid and within the period of six years. Now for each one of the six years to arrange for special care to insure safety and security is no great and arduous thing. And this was well within his means and authority that he could arrange for special arrangements regarding his safety and security but despite all this God Almighty fulfilled the prophecy of the Promised Messiah (as) – although the visible circumstances were against this. His death was destined for the 6th of March. On the first of March Lekh Ram was directed by their organization to go to Multan where he delivered four lectures till the 4th of March. Then he was told to go to Sukhar but the Arya Samaj people of Multan stopped him from going there due to the fact that the plague was rampant there. Pandit Lekh Ram then got ready to go to Muzaffargarh but it is not known why then he returned in Lahore on the 6th of March. If he had not come back that very day, this prophecy would not have been fulfilled but despite the fact that an occasion had arisen for him to remain away even then he arrived in Lahore and was killed at the appointed time. This example is given to establish this fact that despite all necessary arrangements for health and safety and security man can suffer death. So it is clear that Allah, the Exalted, does involve Himself in the affairs of men and He displays His Power as He wishes and how He wishes. Sahibzada Mirza Mubarak Ahmad Sahib whose mention has been made and how taking care of him during his illness had such a negative impact on the health of the Promised Messiah (as) also – the Promised Messiah loved him very much. Hazrat Musleh Maud (ra) makes mention of this love in an incident as follows. He says we had a younger brother whose name was Mubarak Ahmad. His grave is situated to the east of that of the Promised Messiah in the Bahishti Maqbara. He was very dear to the Promised Messiah (as). He says I remember that when we were young we developed a zeal for rearing chickens. [This incident he mentions to show how much the Promised Messiah loved Sahibzada Mirza Mubarak Ahmad and how he would care for him.] So he says that we had this love for rearing chickens and so I had some chickens and so did Mir Muhammad Ishaq Sahib of blessed memory and similarly some were kept by Mian Bashir Ahmad Sahib. And in keeping with this childish zeal every morning we would go and see how many eggs each of our chickens had laid and boast with each other regarding the results..Mubarak Ahmad would also join in this zeal of ours. One day he got ill, by chance, and when news of this reached the Promised Messiah and the lady who used to care for him said that this may have been due to his visiting the chickens and spending lots of time near them in a not very clean environment the Promised Messiah had the chickens counted and all the children paid for the chickens they had and the chickens were used for food. Mubarak Ahmad was clearly very dear to the Promised Messiah (as). When he became ill the Promised Messiah (as) took so much trouble and spent so much time that people thought if he was to die, the Promised Messiah (as) would suffer greatly and would be extremely affected and saddened by it. But the day that he passed away he was seen to be perfectly resigned to the decree of God saying that this was a trust that God had given to us and now that He has taken it back what right have we to complain. So the work of a believer is to serve a fellow human being as much as he can and considers this a means of earning merit in the sight of God but when on the other hand the will and decree of God Almighty comes into operation he does not express any sort of impatience of lack of contentment. But those who are in the habit of complaining earn a double loss, both here and in the hereafter. Then at another place Hazrat Musleh Maud (ra) mention about this again directing his remarks for the people living in Qadian. He says that the people living here will have seen how much the Promised Messiah (as) was concerned with the treatment and care of Hazrat Maulvi Abdul Kareem Sahib and Sahibzada Mirza Mubarak Ahmad. Those who observed this thought that the Promised Messiah (as) perhaps felt that the progress of the Jama’at was dependent on these very persons. During those days there was no other topic other than as to how treatment can be provided for them. But what happened when they passed away? This very same thing that upon their death the condition of the Promised Messiah (as) changed immediately that it left everyone amazed. On the one side was that intense zeal to tend to their care and treatment all day long from morning to night. Or on the other hand at the time of their death the Promised Messiah (as) could be seen very content and secure addressing the people and telling them that Allah had already informed him about their death. At another place Hazrat Musleh Maud (ra) describes the event immediately after the death of Mubarak Ahmad that upon leaving the house he addressed the people saying that this was a trial from Allah, the Exalted, and the members of our Jama’at should not be saddened by such trials. Then the Promised Messiah (as) said that with regard to Mubarak Ahmad I had been given the revelation at such and such a time that he would be taken from us at a young age, so this is actually a cause for happiness that a sign of God Almighty has been fulfilled. Hazrat Musleh Maud (ra) says, ‘so if our brother or some other near and dear relative passes away and there should be a prophecy about him from God Almighty then along with sadness there also would be happiness at his passing away. The happiness would not mean that we consider them unrelated to us, not at all, we consider them to be from among us, but we consider God Almighty to be even closer to us and of us even more so than the ones who have passed away – and it is not possible for us to keep hidden any sign of God ALmighty. So it is our utmost duty that we manifest upon the world both of our beauties: On the one hand we should spread the majestic sign of God Almighty and let the world know that this was manifested as a way of establishing the truth of the Promised Messiah (as) and on the other hand be the source of help and assistance to those affected by the tragedy. Those who die due to tragic events they are also our very own and they may be dying due to the fulfillment of some awe-inspiring events about which the Promised Messiah (as) had prophesied. So it is our duty to help all such who are suffering. This is why the Ahmadiyya Jama’at also helps people in distress. If we display both these, our beauties, then both the powers of Allah will manifest in our favor also. That Power that descends from the heavens and also that which manifests itself from the earth. So these incidents from the life of the Promised Messiah (as) make clear to us various aspects and responsibilities. Serving the needs of the child, concern for his health and treatment, concern for a nearby friend, attention to his care and treatment, expression of happiness upon fulfilment of Allah’s Signs, and when the Decree of Allah manifested itself then feeling as if nothing at all had happened, drawing the attention of the member of Jama’at towards Allah, advising them forcefully to pay attention and struggle mightily for the attainment of high objectives, pointing out that the true purpose is to win the pleasure of Allah, and when we see the fulfilment of Allah’s promises and on the one side we are totally content, on the other when we see the humanity suffering and in need of service there, we have to serve with full force and full attention. Talking about the keenness of Sahibzada Mubarak Ahmad’s intelligence Hazrat Musleh Maud (ra) says there were several reasons why the Promised Messiah (as) loved Mubarak Ahmad so much. One was that he was weak and stayed somewhat ill. So he was the center of his attention and it is natural that when one is the center of someone’s attention he becomes loved by that person. Secondly, although he was younger than all of us and only a few years old he was very intelligent and smart. This also was one of the reasons for him being loved so much by the Promised Messiah (as). He was only seven years old but even at this age he could compose poetry with proper metre. The example of his intelligence and memory is that when he was asked to discover the various rhythms of a poem the Promised Messiah (as) had written, he came up with several and among those there were several very good ones. Then Hazrat Musleh Maud (ra) mentions an incident which tells us that humanity must be served for their physical and material needs also so that one may give expression to the attribute of God Almighty that has to do with His being our Rabb – one who sustains and develops us stage by stage and brings to perfection in stages. He says that I cannot ever forget a scene. I was very young at that time, perhaps sixteen or seventeen years of age when one of our sisters passed away who was only a few months old and she was taken for burial to the cemetery. After the funeral prayer the Promised Messiah (as) picked up the body in his own hands and when Mirza Ismail Baig Sahib asked to take the body from him to carry it to the grave, the Promised Messiah (as) turned to him and said, ‘this is my daughter’ and as my daughter, the very last service that I can provide for my daughter is that I myself should carry her to the grave. Hazrat Musleh Maud (ra) draws the conclusion from this that if you desire to become the manifestation of the “Rabbul Aalameen” [Lord of all the worlds] attribute of God then it is necessary for you also that you serve God’s creation materially. If you give away all your possessions in the service of the faith, and spend all your income in the spreading of the faith of Islam, you will become those who have adopted and manifested in their persons the attribute of ‘Malik’ – ‘Master’ but you will not become those who have adopted and manifested in their persons the attribute of ‘Rabbul Aalameen.’ Because in order to do this it is necessary that you work with your own hands and remain devoted to serving the poor with full attention. This is the beautiful clarification that Hazrat Musleh Maud gave that try, with your own hands, to serve not only those who are related to you but also those who are not so related. If we ponder on this we will see that this has some very wide ranging results which can bring about the nearness of an entire nation or people – they can become so very close to each other as a result of these type of actions to do with serving each other and if every part of the society acts on this it can result in a very beautiful society. Then Hazrat Musleh Maud (ra) mentions the case of a mosque in Kapoorthala that became a sign of the truth of the Promised Messiah and showed how much trust he had in Allah. This case went to the courts and the members of the Jama’at became concerned over the attitude of a judge handling the case and so they wrote for prayers to the Promised Messiah (as). He told them in response that if I am indeed true you will be given the mosque while on the other hand the judge continued with his opposition and wrote a decision against the Ahmadis. On the next day of delivering this decision the judge was getting ready to go to court when he had a heart attack and died. The judge that took over the case then delivered the decision that was in favor of the Jama’at. This proved to be a source of great faith increase for the members of the Jama’at. So it is a practice of Allah the Exalted that He gives news of the unseen through His Messengers. And this causes the faith of the believers to increase even more when these revelations prove to be true. Hazrat Musleh Maud (ra) mentions a vision of the Promised Messiah (as) that was fulfilled in a matter of minutes. He says about this that sometimes a vision is shown in full wakefulness that is in need of no interpretation but is manifested in exactly that same way as seen. So we find examples of this in the incidents from the life of the Promised Messiah (as) and the visions he saw. Once the Promised Messiah (as) saw in a vision that Mubarak Ahmad is lying next to a mat and has suffered a severe injury. No more than three minutes had passed from this vision having been seen that Mubarak Ahmad who had been standing next to a mat slipped and fell and suffered a severe injury as a result of which his clothes became stained all over with blood. Then talking about the initial days of Qadian and talking about the progress of Qadian and of the Jama’at Hazrat Musleh Maud (ra) says that there was a time came when there was no one with the Promised Messiah (as) and then the time came when there were thousands with him and now these numbers have grown to the hundreds of thousands. Then, there was a time when there was not a single person who believed in him in the Punjab; but now, his followers have spread not only in India, but in all the continents of the world. If this is true that the world does not believe in him then from where have all these people come? And now entire countries are becoming Ahmadis or Ahmadiyyat is spreading in them. He says, look at this scene right here. From among the people sitting in front of me, how many from among them are those who accepted in the early days of the Promised Messiah (as)? I think there will be very few in this gathering who will have seen the face of the Promised Messiah (as) in person. Mostly they are those who only saw his picture. Then there are some who saw his face but who were not afforded the opportunity to sit in his company. And there would be very few, not exceeding a few dozen who heard him speaking and were blessed the chance to benefit from his company. So, the questions is, in the end, where did all these people come from? Hazrat Musleh Maud (ra) says my birth and the beginning of bai’ats start from almost the same time. And when I became conscious of my surroundings and whereabouts and had grown up to this age, several years had already passed of preaching among the people. I remember from that time that when the Promised Messiah (as) used to go out for a walk only Hafiz Hamid Ali Sahib used to be with him. Once the Promised Messiah (as) came for a walk to a particular area and because I was a small child at that time I insisted on accompanying him …and at that time there used to be only bushes here and all this area where now stand the Talimul Islam High School and boarding houses and mosque etc…there was a jungle here and there used to be here nothing but bushes…the Promised Messiah (as) came to this place for a walk and upon my insisting took me along with him.. but a little time later I said I was tired and so at times the Promised Messiah (as) and at times Hafiz Hamid Ali Sahib would pick me up and I remember this scene till today. This was a time when the Promised Messiah (as) had made the claim but those who had accepted him were very few in number indeed. And rare was the time that somebody came to Qadian. But today [this was 1937 when Hazrat Musleh Maud (ra) was saying this], this is the time that we have to announce again and again that before the people migrate to Qadian they should get permission but if someone migrates to Qadian without permission he may be obliged to go back. Indeed all these incidents are a cause for the increase of our faith and conviction. May Allah continue to increase us all in faith and conviction. And may we all be the persons that may be of benefit to the Jama’at. Aameen! After the Salat I will lead a funeral prayer in absentia of Respected Naseem Mahmood Sahiba, wife of Syed Mahmood Ahmad Shah Sahib of Karachi who passed away on 27 April 2015 at the age of 58 in Karachi, Pakistan due to cancer. inna lillahay wa inna elaihay rajayoon.